On December 30, 2014, NASA released their raw 30-meter (1 arc second) accuracy topographical data for the world which came from its Shuttle Radar Topography Mission (SRTM). The data provides stunning accuracy and detail for the Philippines. Schadow1 Expeditions has acquired the data and explains the importance of this data for the Filipino. The processed SRTM 1-arcsecond topographic data above shows the Macolod volcanic corridor showing high detail of topography for Mounts Talamitam, Batulao, Taal Volcano, Maculot (Macolod), Makiling, Malipunyo Range, Kalisungan, Cristobal and Banahaw (west to east). Topographic data is an important data set that every nation must have. Just like a navigation map, a topographic map helps people to know more about an area of their country which concerns elevation. Outdoor enthusiasts, adventurers, mountaineers and hikers immensely benefit from such data in providing them familiarity of the terrain before they head on to an expedition. Thus enabling them to plan feasible trails for their exploration even before setting foot on the location. This also allows them to measure the difficulty of the terrain and provide the length of the trail but using accurate measurements that does not only include direct flat length measurements but also taking consideration of the additional lenght due to elevation. For the geologists, geographers, and disaster resiliency planners, topographical data is an integral part of their work; allowing them to tag geographic hazard zones such as fault lines, earthquake hazards, and habitable zones. Through topographic data, scientist can also calculate fluid flow and derive data for flood hazard maps and direction of water during heavy rains. Below is a processed SRTM 1-arcsecond topographical data of South Luzon, showing detail of the West Valley and East Valley Fault line that pierces through Metro Manila and nearby provinces such as Rizal, Laguna, and Cavite. 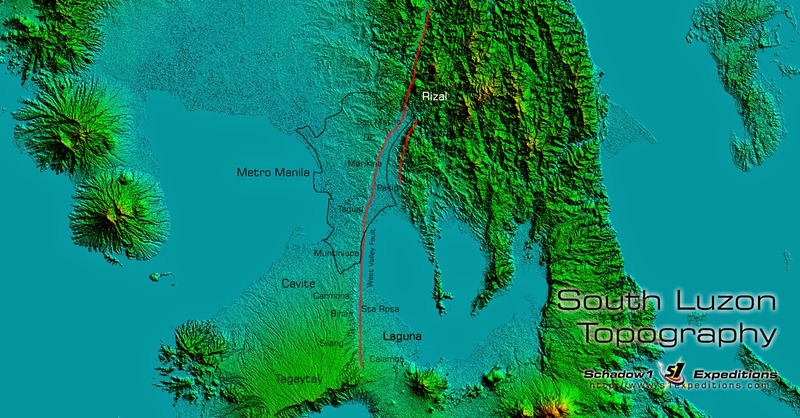 The West Valley fault line is a slip-fault system where landmass from the western side of Metro Manila and Cavite collides with the land mass of Rizal and Laguna pushing the latter landmass below the western landmass. The fault has last moved last 1658 and poses risk for the densely populated areas as it can produce earthquakes greater than magnitude 8 in a 200-400 years interval. See Interactive map of the West Valley Fault Line. of the West and East Valley Fault Line that pierces through Metro Manila. Click to zoom. The Shuttle Radar Topography Mission (SRTM) is a project of United States' National Aeronautics and Space Administration (NASA) which was launched via an 11-day Space Shuttle (STS-99) mission last February 2000 that orbited the earth several times to acquire elevation (topographic) data of the world. The initial global public release of the topographical data was made last 2006 with a 90-arcsecond (90 meters) accuracy. A GroundTruth topographical map of the Philippines was derived from this data and was compiled at 10-meter elevation contour intervals. There were however data flaws with the initial SRTM data, where some of the jagged terrains of mountain ranges are not acquired thus having blank topographic data called "voids". with the release of both SRTM-AsterGDEM 3-arcsecond data and SRTM 1-arcsecond data. On the same year of SRTM launch, Aster GDEM mission, a Japanese sensor on-board the Terra satellite, a multi-national owned satellite launched by NASA has been collecting imagery of the earth on a different wavelength, has also provided topographical data. The data has been released to public last 2011 and GIS specialists has mixed the SRTM 3-arcsecond data with the Aster GDEM data to fill in voids using a software algorithm. The joint SRTM-AsterGDEM data has provided astounding detail of the world's topography in 90-meter accuracy when the mixed data was provided December 2011. On September 2014, the United States government has announced at a United Nations Climate Summit that they will be releasing anew highly accurate topographic data of the world. On December 30, 2014, a 1-arcsecond (30-meter) accuracy topographic data from the SRTM mission has been released. This data, so far, is the most accurate topographical data available. Schadow1 Expeditions has acquired this data and processed it to provide a 30-meter accurate elevation map of the Philippines at 10-meter elevation contour interval and released it as a free download at #mapPHL as version 2 of its Philippine Elevation map released last January 29, 2014. The map can be uploaded to a GPS-assisted navigation device and can be used as an overlay to an existing Philippine road map which may be used by navigators and trekkers to guide them on their way. Version 1 of the Philippine Elevation Map by Schadow1 Expeditions is based on SRTM-AsterGDEM 3-arcsecond void-filled data. The SRTM 3-arcsecond based elevation map of the Philippines was released as GroundTruth Philippines Elevation map in 90-meter accuracy on 10-meter elevation contour steps. Although accurate, it is noted with many blanks (voids) on some jagged terrains. The joint SRTM-AsterGDEM 3-arcsecond based elevation map of the Philippines solved the blanks issue and void-filled the blanks of the initial SRTM data using estimation via software algorithms; giving a the cleanest and accurate elevation contour map of the Philippines. Schadow1 Expeditions released an Elevation Contour Map of the Philippines using this data last April 2014 and tagged as version 1. 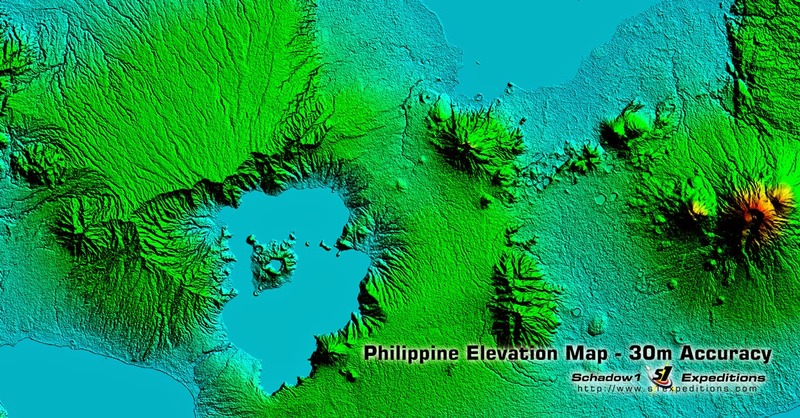 Below is a visual comparison of the Philippine Elevation Map supplied by Schadow1 Expeditions. From the GroundTruth data to versions 1 and 2 of Schadow1 Expeditions' Philippine Elevation Map which was released March 26, 2014 and January 28, 2015. Mt. Mayon (Albay) Elevation Contour Lines on various topographical data sets. Mt. Apo (Davao-Cotabato) Elevation Contour Lines on various topographical data sets. Mt. Pico De Loro (Cavite-Batangas) Elevation Contour Lines on various topographical data sets. Mt. Pulag (Cordillera Region) Elevation Contour Lines on various topographical data sets. The latest SRTM 1-arcsecond based elevation map of the Philippines is currently the most accurate elevation contour map of the Philippines down to a 30-meter accuracy. Although not yet void-filled, most of the voids have been cleared and what remains are some blanks on jagged peaks of the Cordilleras in Bakun, Biliran and some in Leyte. We have released the latest Philippine Elevation Map based on this data as version 2.